Yorkshires are white in color and have erect ears. 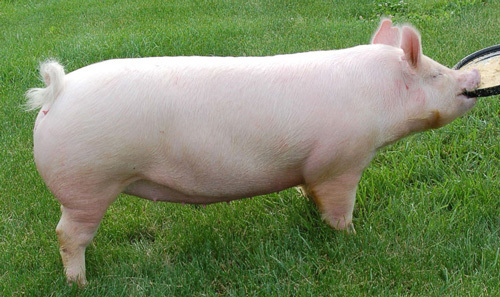 They are the most recorded breed of swine in the United States and in Canada. They are found in almost every state, with the highest populations being in Illinois, Indiana, Iowa, Nebraska and Ohio. The modern Yorkshire is very muscular, with a high proportion of lean meat and low backfat, in addition to being very sound and durable. The Yorkshire breed was developed in England in the county of York. Later the name was changed to "English Large White" but it is known as Yorkshire throughout most of the rest of the world. There are three types of hogs referred to as the Yorkshire: the large, the middle and the small types. Only the large type has ever gained any prominence in the United States. In 1761, Robert Bakewell became interested in a local tribe of hogs known as the Leicestershire breed and he molded them into a large, useful hog that became popular in England. It is very likely that some, if not most, of the best Yorkshire hogs today came from these hogs. The first Yorkshires in the United States were brought into Ohio around 1830. The Yorkshire breed experienced many ups and downs over the years. In the early 1920's, the Morrell Packing Company of Ottumwa, Iowa, and the Hormel Packing Company of Austin, Minnesota, tried to promote Yorkshires to farmers around the area. This was following World War I and the market for lard was vanishing. They failed to gain popularity with farmers due to their slow growth rate and short, pugged noses. The favor of farmers with the Yorkshires didn't come until the importation of many English Large Whites from the British Isles. Farmers realized what they could do for them and soon started to accept Yorkshire breeding stock. Mothering ability, larger litters, more length, more scale and frame were in such demand that many producers were ready to try Yorkshires again, and this time they were successful. In the late 1940's there was a period of rapid breed expansion. A large percentage of Yorkshires were brought in from Canada where the breed had been the most popular breed because of it's ability to produce the kind of carcass that was in demand in that country. Yorkshires were also being imported from England where they were known for having greater substance, ruggedness, and scale. By selection, and the use of the imported pigs, they met the needs of the pork producer and the demands of the market in this country. Today, Yorkshires are productive, yet more performance oriented and more durable than ever. The goal of the Yorkshire breed is to be a source of durable mother lines that can contribute to longevity and carcass merit. The motto of "The Mother Breed And A Whole Lot More" indicated the improvement and changes that the industry has seen. Yorkshire breeders have led the industry in utilization of the "STAGES" genetic evaluation program. From 1990-2006, Yorkshire breeders submitted over 440,000 growth and backfat records and over 320,000 sow productivity records. This represents the largest source of documented performance records in the world. The American Yorkshire Club was organized on April 1, 1893, in Minneapolis, Minnesota. The office was first in St. Paul, Minnesota, and was moved to Valparaiso, Indiana in 1948. The first club was a stock company. In 1948, the American Yorkshire Club was reorganized and became a membership organization.